EU leaders have approved a deal to step up training, the supply of equipment and other support for the Libyan coastguard, following a summit in Malta today that was backed by Presidency Council head Faiez Serraj. The move is part of a wider, new €200-million plan to stem the flow of migrants from Libya across the Mediterranean. This also includes upgrading migrant camps in Libya, along with the IOM and UNHCR, and funding to the IOM to help the repatriation of migrants who do not have a case for asylum. Particular attention and financing will also given to Libya’s porous borders, especially in the south, along with additional support from Tunisia, Egypt, Algeria and Niger. 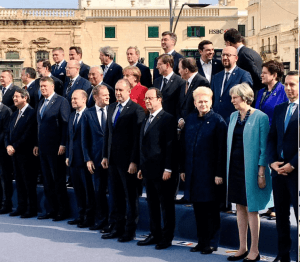 “A key element of a sustainable migration policy is to ensure effective control of our external border and stem illegal flows into the EU,” the Malta summit declaration read. Agreed by the EU’s 28 member states, the declaration is part of a general crackdown on human trafficking and attempts to stem the tide of migrants crossing the Mediterranean to Libya. The latest measures followed an agreement on Thursday night between Serraj and the Italian Prime Minister Paolo Gentiloni who promised to give Libya additional financial support. Their agreement also called for the “humanitarian repatriation” of migrants. Although described as a piece of the wider plan to be implemented by the EU, the Italy-Libya understanding appears to be a stand-alone agreement. In one of the first responses to the EU declaration, however, Amnesty International condemned the attempted closure of the EU’s southern sea borders, insisting it would “put thousands of refugees and migrants setting sail from Libya at risk of detention and appalling human rights abuses”. It appears that, under the new EU agreement, Libya will take greater responsibility as with power and funding increased to local communities to deal with the migrants. However, with the Government of National Accord wielding limited or no control over many areas of the country and some migrant detention facilities reportedly complicit with smugglers, it is unclear how effective the EU decision will be. Dealing with the migrant crisis continues to be a major task in the Mediterranean. Aid agencies report 785 people who were heading for Italy rescued in the last couple of days. Prior to his Rome meeting with Gentiloni, Serraj was in Brussels to negotiate the increased support from the EU and NATO. Following a meeting with NATO secretary-general Jens Stoltenberg he conceded that Libya could allow NATO ships to operate in its waters, so long as the EU and NATO help to upgrade the Libya navy to combat people smugglers.